n the Presence of His Majesty features excerpts from previously unpublished works by best-selling devotional writer Oswald Chambers. These writings were first printed when Chambers's wife transcribed them from her shorthand notes in December 1918. These pieces remain timeless treasures, as do all of the author's writings. Each section is filled with powerful words that prod the heart and mind to a deeper devotion to His Majesty. - Publisher Enjoy more timeless treasures from the inspirational pen of Oswald Chambers with this collection of devotional writings never before published in the U.S.! First printed in England in 1918, these works are grouped into six sections: Prayer, Service, Faith, Virtues, Devotion, and Comfort. - Publisher Disovering God in everyday life is deepened when we purposefully practice His presence. Enjoy the beautiful 4-color photographs and timeless quotations by this beloved author, who walked with God. 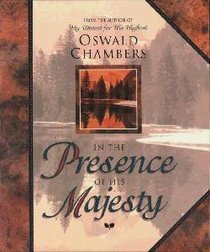 About "In the Presence of His Majesty"
Enjoy more timeless treasures from the inspirational pen of Oswald Chambers with this collection of devotional writings never before published in the U.S.! First printed in England in 1918, these works are grouped into six sections: Prayer, Service, Faith, Virtues, Devotion, and Comfort. Disovering God in everyday life is deepened when we purposefully practice His presence. Enjoy the beautiful 4-color photographs and timeless quotations by this beloved author, who walked with God.